Christmas done, holidays over, seems it’s time to take a break from all that shopping done for holidays and get back to routine. While getting back to routine might be inevitable, break from shopping is a big no-no. For those who know shopping also know post-Christmas is perhaps the best time to shop. Most of the stores offer stuff at bargain basement prices at their clearance sales. Most of the brands are at their cheapest best prices. 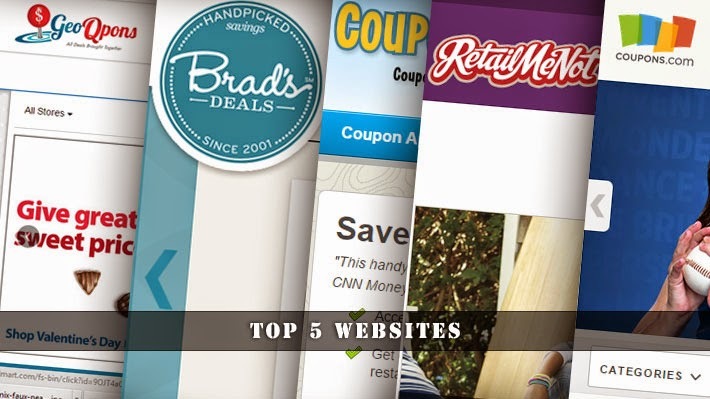 Here’s a list of top websites that offer discount coupons on already slashed down prices. Geoqpons.com brings together the best discount coupons, weekly deals, printable coupons, other savings deals and sales for hundreds of leading online stores to help save you more money. Updated around the clock, GeoQpons constantly add latest coupon codes for over hundreds of the America's favorite retailers and brands. As they say, if there’s a coupon worth using, they'll have it. The GeoQpons app has a staggering 4.5 million users who shop smart and save hundreds of dollars and precious time looking out for the right deal. The GeoQpons app has perhaps the highest rating amongst coupon apps with 4.5 stars on Google Play and the App store. The GeoQpons app has smart, intuitive features along with Geofencing that presents the right deal (based on your shopping pattern) on your preferred brand, at the right time and the right place (based on your current location). Amongst most retail apps that promise the world to the user, GeoQpons app comes out as a real winner. Bradsdeals.com brings together the latest deals and discount coupons from leading stores across the country. The coupons on this site are regularly updated. You can navigate the site based on looking out for deals and discounts on a particular item, latest coupons available for various brands and stores or look out for deals and discounts for specific stores. The website is neat and navigation is simple and easy. Coupon Sherpa is the online source for discounted shopping. There are sales, deals and discounts for some of the top brands and stores. There are discount coupons for almost everything ranging from home stuff to fashion apparel, accessories, shoes, grocery, pet stuff, office ware and lots more. coupons are regularly updated and there have hardly been instances of coupons getting rejected or void. Retailmenot.com is yet another source of discount coupons and deals. The name comes from the premise that you would not have to pay retail prices anymore; they’ll offer discounted rates for almost everything you need. The site is regularly updated with the latest coupons online. A bonus with the site is that they give detailed information about each store. Not that this helps with the shopping but a little information on the store just adds to the credibility. Coupons.com is a great platform that connects brands and retailers with consumers online. The site has coupons for leading grocery, drug and mass merchandise retailers. Choose from a range of e-coupon codes for your online shopping or printable coupons if you are having a day out shopping. Either ways shopping with coupons is fun. Thank you for sharing the list of the website to get deals and discounts. If you are looking for best shopping deals app, then skoutdeals.com is the best. Nice blog shared about deals and coupons website. By shopping online, you can get Very discount code and coupons on different products.